After spending the summer (and most of my life previous to that) being around horses, I jumped at the chance to go Autumn hunting with my big cousin, Ben Darlington, and the Blackmore and Sparkford Vale. Hunting is something I have dreamt of for a long time, but never actually had the chance to do. I learnt a lot about hunting logistics this summer, as I spent seven weeks in Virginia with the wonderful Anne McIntosh, master of the Blue Ridge Hunt, but the time had finally come to put all of this into action. Getting up at half-past four in the morning is very rarely a worthwhile task, but on this occasion the early start didn’t worry me at all. My bleary-eyed expression was matched by that of the poor horses who were being woken up at just as unnatural an hour. Luckily Ben had given me an in-depth briefing the night before, with details right down to where the light switches were in the stables, so I wasn’t left fumbling around in the dark. My noble steed for the day was a big bay five-year-old called ‘The Bus’. Despite his tender age, his experience in the hunting field seemed to far outweigh mine — which was somewhat of a relief! By six o’clock on the dot the horses were fed, groomed, bandaged and loaded. Ben and I were ready in a similar fashion. I couldn’t quite believe that the time had finally come to don a tweed jacket and follow a fresh pack of hounds across the open countryside. Surprisingly no nerves had appeared, and I was itching to arrive and get on. 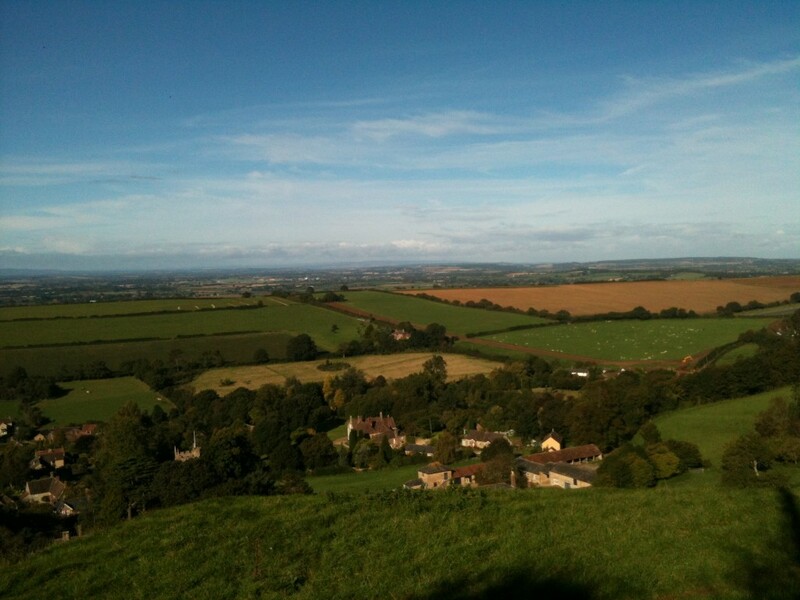 We were heading to the summit of Corton Denham hill, which I had seen from a distance standing above most other hills in Somerset. We wiggled around some extremely narrow little roads, luckily not meeting any morning traffic coming in the other direction, and I did begin to wonder whether Ben really knew where he was going. We passed the old house in South Cadbury where my father grew up: something which I took to be a lucky charm for the day. I’d say it paid off. We arrived on top of a cold and very windy hill in a muddy farm yard. Within minutes my fingers were numb. But the sun was now beaming, having just come up, and we couldn’t have picked a better day for my Blackmore Vale debut. The Bus was quivering, whether with excitement or chilliness I couldn’t decide. 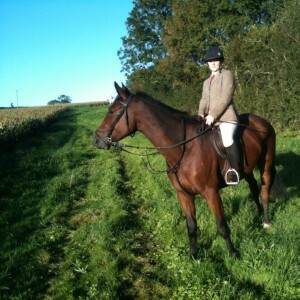 There were no more than around thirty horses there, a nice small mounted field whilst I got used to everything. The view from the meet. I’d been able to try The Bus the afternoon before, which was really reassuring. That outing had also given Ben the chance to swap to a different bit that suited us better. Setting off at seven o’clock sharp The Bus soon settled into a steady pace, cantering through the edge of a deep ploughed field as though it was nothing. I was grinning from ear to ear; finally we had made it. Before long we became separated from the rest of the group whilst trying to find a way round a big bank. This seemed to happen a few times, but it made the whole thing even more fun as we tried to navigate our way across the countryside towards the man in scarlet! We were lucky enough to find ourselves perched on the side of the hill at one point, looking down onto a small maize field whilst the hounds and and huntsman flushed it through. It was my first chance to see the hounds in action and with a birds-eye view! The Bus had settled down even more, taking the whole thing in, but I could tell he was desperate to be in the thick of the action: every time the huntsman sounded the horn his ears pricked and he seemed to quiver again. This time it definitely was with excitement. At every pause I was struck by the beauty of the day, the wonderful countryside, and the lucky hand that I had been dealt. When we were let loose across the fields, even just at a steady canter, the adrenaline flowed and I honestly could not have felt happier. Ben and I marvelled at all the unfortunate people heading off to offices and city day jobs, when we had already been up for hours with our fantastic horses. By half-past ten the Bus had decided to remind me that he was only five, fidgeting and getting a tiny bit grumpy, so we decided to head home. I felt elated at the fact that I finally had a day’s hunting under my belt, and that it had been such a success. We headed back to Keinton Mandeville to give our horses a well earned break, and in search of one of Pat’s celebrated cooked breakfasts! Food had never tasted so good, and life had rarely felt so great! Going back to University will be even more of a challenge after this. This entry was posted in Hunting Diaries Blog by Charlie. Bookmark the permalink.